The POES satellite system offers the advantage of daily global coverage, by making nearly polar orbits 14 times per day approximately 520 miles above the surface of the Earth. The Earth's rotation allows the satellite to see a different view with each orbit, and each satellite provides two complete views of weather around the world each day. 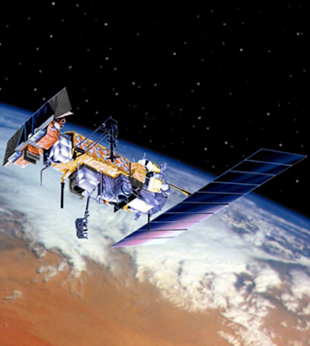 NOAA partners with the European Organisation for the Exploitation of Meteorological Satellites (EUMETSAT) to constantly operate two polar-orbiting satellites – one POES and one European polar-orbiting satellite called Metop. The POES instruments include the Advanced Very High Resolution Radiometer (AVHRR) instrument and the Advanced TIROS Operational Vertical Sounder (ATOVS) suite. The EUMETSAT-provided Microwave Humidity Sounder (MHS) instrument completes the ATOVS suite. The AVHRR/ATOVS provides visible, infrared, and microwave data which is used for a variety of applications such as cloud and precipitation monitoring, determination of surface properties, and humidity profiles. Data from the POES series supports a broad range of environmental monitoring applications including weather analysis and forecasting, climate research and prediction, global sea surface temperature measurements, atmospheric soundings of temperature and humidity, ocean dynamics research, volcanic eruption monitoring, forest fire detection, global vegetation analysis, search and rescue, and many other applications. Page updated on January 27, 2017.